"The scorching blade slashed at my eyelashes and stabbed at my stinging eyes. That's when everything began to reel. The sea carried up a thick, fiery breath. It seemed to me as if the sky split open from one end to the other to rain down fire." Here is an intense sample of this book and its rich detail that paints so clear in your mind that you can feel and see it. Although, I personally disliked this book, I can't deny it of its literary merit which makes the book a powerful voice and is a reason to read it. It was easy to read and very thought-provoking. "Yes, it was the hour when, along time ago. I was perfectly content, what awaited me back then was a night of easy, dreamless sleep. And yet, something had changed, since it was back to my cell that I went to wait for the next day...as if familiar paths traced in summer skies could lead as easily to prison as to the sleep of the innocent." I liked the combative imagery of the words: familiar paths, summer skies, prison and sleep. Since, I was curious about Albert Camus, I found out a bit about him. Camus' little book was published June 1942: “L’Etranger” (The stranger). 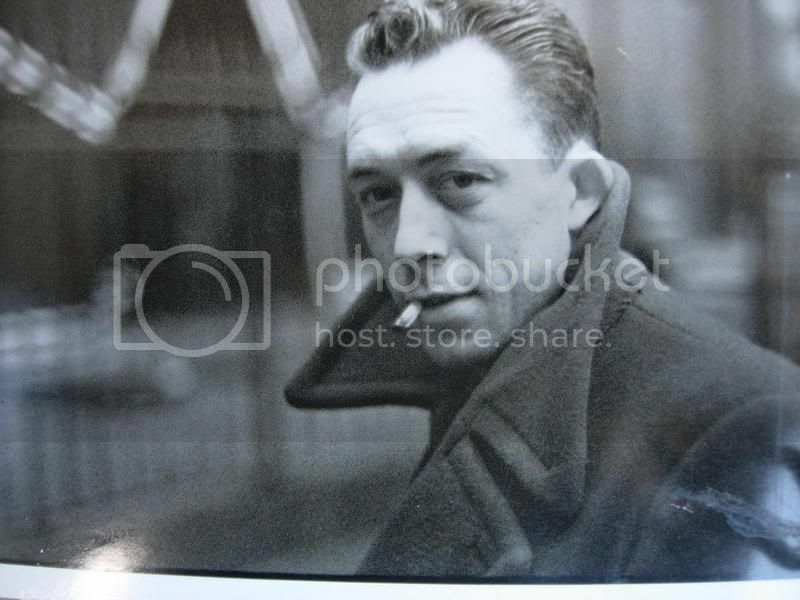 At that time, Camus was an unknown author and was only 28 years old. In the 2oth century, he is known for modifying the history of both literature and philosophy through his expression of what he termed "the nakedness of man faced with the absurd." He also won a Nobel Prize for Literature in 1957. The translation I read was by Matthew Ward. So here's my question, Julie - does the book make sense to you, aesthetically, after our book group discussion? I know you won't come to like the book, but does it feel more academically pleasing? Like I hated Madame Bovary, but studying it was interesting. Yes, it does make sense to me. The book group helped and I hadn't considered the meaning of amoral until then. Early on you helped me understand more about absurdism which helped a lot. Academically, it was great to study and I appreciate the book on an intellectual level.